Ok this one goes out to college students who live on campus in a dorm room. Maybe you're tired of eating cafeteria food. Maybe it's 1:30am, you're pulling an all nighter, you can't focus on finishing your paper because you're STARVING, and you want something more than a snack from the vending machine down the hall. Or maybe you just miss a nice hot meal. Does any of this sound familiar? Well, here's the answer! Why not cook up something delicious and hearty, right in your dorm room? 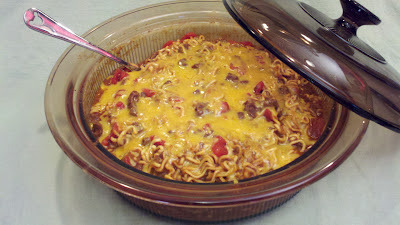 This entire dish is made in the microwave, and you need practically NO cooking skills to make it. It's crazy cheap, and it uses just a few ingredients that you can have your parents mail to you in your next care package! Cool, huh? Oh, and the only cooking equipment you'll need (in addition to a microwave) is a 3 quart casserole dish with a lid, a can opener, and a spoon. Actually, it would be easier if you have a strainer too, but you could still do it if you don't have one. Come to think of it, if you buy cans that have a flip top lid, you don't even need a can opener!! So make sure you pack those items before you go back to school. It's easy, it's quick, it's makes PLENTY so there's enough to share, it'll fill you up, it's faster than ordering take out, and most of all it's delicious! I betcha everyone on your floor will want some!! Place about 6 cups of water in a three-quart casserole dish, and microwave on high for about 3 minutes. Meanwhile, crush the packages of noodles, slightly. Carefully open the noodles, and remove the seasoning packets, which you won't be using for this particular recipe. Carefully place the noodles in the casserole dish being sure to submerge all the bits, breaking them into smaller bits if necessary. Cover and microwave on high for 5 minutes, stirring halfway through cooking time. Remove from microwave and drain well. Open the cans of chili and tomatoes (do not drain). Add tomatoes and chili to the noodles. Toss well. Replace cover and microwave on high for another 5 minutes. Sprinkle with cheese and replace cover. Let stand until cheese melts. Use any kind of chili you like.... With or without beans, vegetarian, spicy, mild, all good. Same thing with the cheese. Any kind will do. Even a few shakes of Parmesan cheese would be fab. Btw, this recipe is not my own, and I have no idea who came up with the cheesy name!